Greetings friends and fellow crafters, LeeAnn here with my Friday post for Evaney's Stamp Designs. I used the Scalloped Die from the Christmas Celebration Die set, and I used the Sentiment, Starbursts, Fox and Bunny from the Carried Away Stamp set. The sentiment was stamped with Versafine Onyx Black. I stamped the starbursts using Brilliance Gold Pigment ink, and the topper for the shaker card was blended using Broken China and Cracked Pistachio Distress Oxides. The shaker bits came from my stash. I hope you have enjoyed this project today. 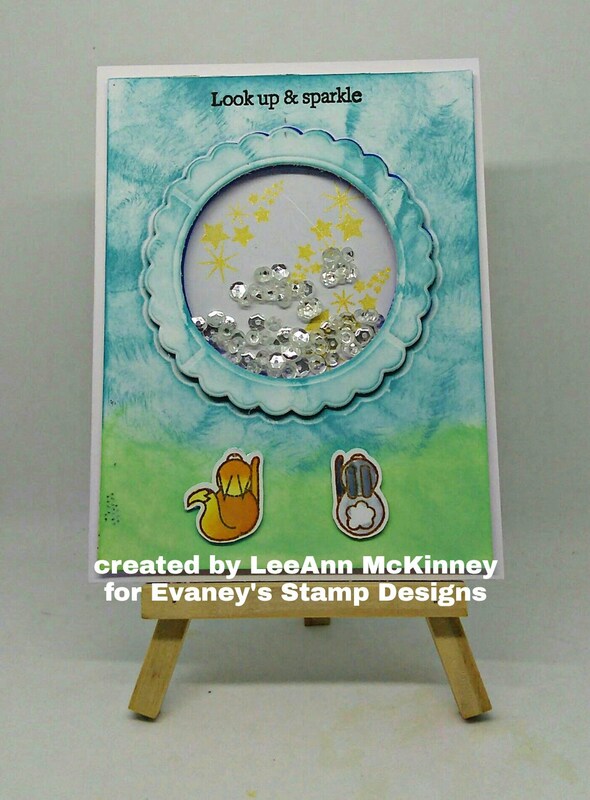 Please be sure to check out the other fun products at the Evaney's Stamp Designs website.